Berthe Morisot was so anxious about Portrait of the Artist's Mother and Sister following Manet's adjustments that her mother temporarily reclaimed it from the Salon jury after it was submitted. Portrait of the Artist's Mother and Sister shows Moritost's mother reading to the artist's sister, Edma. Edma is sat behind her looking isolated. The lonesome appearance on Edma's face could be interpreted as either a reflected expression of how Berthe Morisot was feeling or Edma's own dissatisfaction with her marriage. Although she was happy with her husband she also dearly missed painting next to her closest confidant. Morisot was extremely nervous about sending Portrait of the Artist's Mother and Sister to the jury and relayed her fears to her close friend and fellow artist, Manet. Although he had originally only come to look at the work he believed that Morisot was asking him to adjust her painting. To Morisot's disgust Manet worked on the portrait himself, focusing on the image of her mother in the foreground. He began by placing a few brushstrokes on the bottom of Madame Morisot's dress, which pleased Morisot. But, legend has it that once he commenced he became so enthused that he began working on other parts of the composition. When he started to work on the head of her mother Morisot was not impressed and became convinced that he had ruined her painting. The situation was not helped when Morisot's mother agreed that Manet had spoiled the portrait whilst working on the head. Portrait of the Artist's Mother and Sister was exhibited at the Salon and although Morisot enjoyed the initial praise her misgivings persisted. 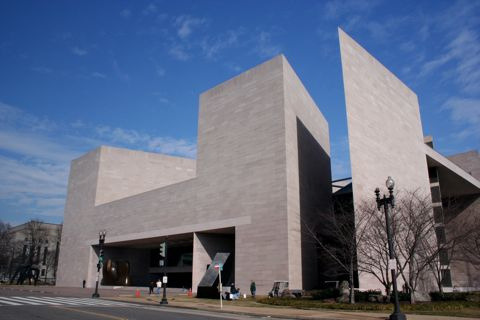 The work was then bequeathed to the National Gallery of Art in Washington DC in 1965 where it is still exhibited today. The inspiration behind the creation of Portrait of the Artist's Mother and Sister was two-fold. Firstly, the painting was created to be entered into the Salon in 1970 to hopefully be exhibited in their summer show. Morisot wanted to be seen as a professional artist and having her work accepted by the Salon jury was extremely important for this goal to be achieved. Before Portrait of the Artist's Mother and Sister was produced Morisot knew that she wanted to paint a portrait that would express her objectives as an artist. Although she was hesitant about what her own style of painting was she knew that it existed and that it was not conventional. Thus, Portrait of the Artist's Mother and Sister was painted at a crucial time in Morisot's career. She was exploring how she wanted to work and it inspired her to create a modern image. The second inspiration behind Portrait of the Artist's Mother and Sisters' creation rested with Morisot's pregnant sister, Edma Pontillon. Berthe and Edma were extremely close and prior to moving away her sister frequently worked alongside her. When the two were young girls they had decided that they both wished to become professional artists. However Edma's recent marriage meant that she was no longer living with Berthe and had given up her art. Nevertheless when Edma visited the family home she still acted as Berthe's model. Consequently Morisot was motivated to create Portrait of the Artist's Mother and Sister because Edma had come home and was able to model for her once again. Edma was also preparing for her first child. The viewer can see that she is visibly pregnant in the picture. Morisot documented her family's lives and this was an important time for her favorite sister. In Portrait of the Artist's Mother and Sister Edma is sat on a plump floral couch that reflects her own condition (round and pale with a blue bow in her hair). In front of Edma and next to their mother is a dark, wooden tripod table with a vase of purple flowers rested on it. Edma is in the background with her brown hair pleated and she has a rather sad expression and appears to have little interest in what her mother is reading to her. Her mother's dress is very different from Edma's. 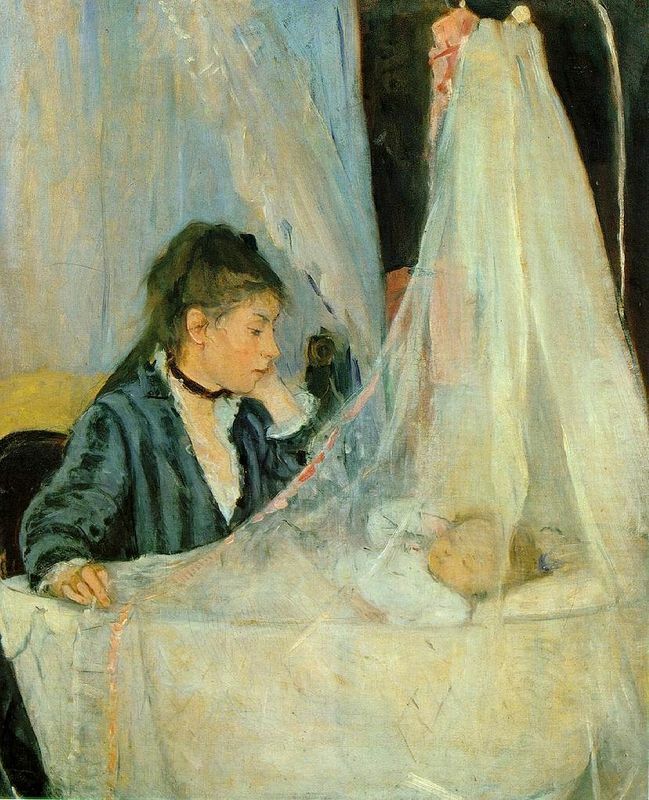 Morisot's mother is focused and her eyes are looking down to read from a book. The strong contrasts between the mother and daughter highlight to the viewer Edma's isolation. In Portrait of the Artist's Mother and Sister Edma's bright white dress and blue bow create an impression of youth. The purple flowers in the vase and the sunlit couch add to this overall impression. 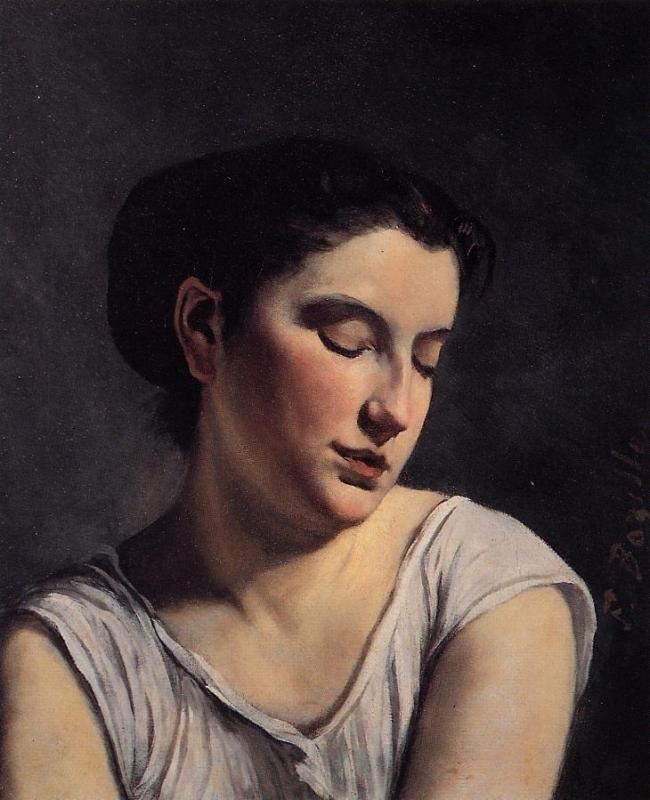 Her mother is sat a little way from her and she is painted in dark colors that are stressed by her solemn expression. Even the book Morisot's mother is reading from is bound in a dark brown cover. created these effects using a color palette that reflects nature. Close up the painting seems imprecise but from a distance the colors merge together. Portrait of the Artist's Mother and Sister was created in natural light. Edma is sat near to a window and light is straining into the room and is most brilliant where it hits Edma's dress. The shimmering white color of the natural sunlight is resplendent on her wrists and chest. However Madame Morisot is faintly lit in the small amount of daylight. The tone of Portrait of the Artist's Mother and Sister is astonishingly serious with regards to the events surrounding its creation. For example Morisot must have been delighted to have the company of her sister again but she paints her looking sad. Furthermore, it was a happy period in Edma's life because she was expecting her first child. Portrait of the Artist's Mother and Sister is the last portrait Morisot painted of her sister before she became a mother. Portrait of the Artist's Mother and Sister was successfully accepted by the Salon jury and exhibited at its 1870 show. Morisot's good friend Puvis stated the overall picture was good and Manet was delighted after he had worked on it himself. While Portrait of the Artist's Mother and Sister was not upheld as a work of genius, Morisot's famous painting was praised and critiqued by its many observers. This was despite Morisot's continuing anxiety about the work and her dubious feelings about its reception. In a letter to her sister Edma she wrote both that "everyone is pleasant enough (about Portrait of the Artist's Mother and Sister) to leave me no regrets" and "this miserable painting still preoccupies me". It was only the artist Degas who had anything detrimental to say but, writing to her sister, Morisot maintained that this was because Degas disliked all of her work. The critics reviewed Portrait of the Artist's Mother and Sister positively although they rather derogatorily referred to Berthe Morisot as a woman painter. Even though it was accepted that women could become skillful artists they were not considered able to become as proficient as men. 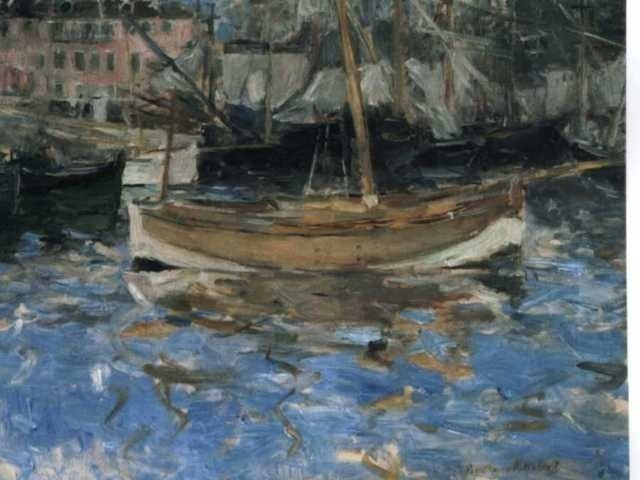 Though, this was only the beginning of Berthe Morisot's career - it truly flourished when she exhibited with the Impressionists. Despite the initial positive reaction to Portrait of the Artist's Mother and Sister it was not exhibited after Morisot's death until 1919. Although the period before the Prussian war was instrumental to Morisot's growth as an Impressionist artist her work fell out of fashion. Despite this, during the 1930s Portrait of the Artist's Mother and Sister was well-received in Belgium. When Morisot's popularity expanded in the latter half of the 20th century art critics began to take note of the Portrait of the Artist's Mother and Sister once again and the story of Manet working on the composition was intriguing to many. A running theme through Morisot's work was family and children and she completed many paintings using her sister Edma and her nieces as artist models. The Cradle was completed in 1873 and features Edma staring lovingly at her newborn baby, Blanche. Morisot's sister is fully absorbed in her child and does not seem aware that her portrait is being painted. This gives an element of spontaneity to the work and Berthe truly captures an intimate moment between a mother and her newborn child. The viewer can visibly see changes in Morisot's painting style between the Portrait of the Artist's Mother and Sister and The Cradle. The paint work in The Cradle is even more chaotic and the amalgamation of colors is greater. Morisot was clearly more confident about her Impressionist style when she created the second composition. In 1868 Morisot was deeply impressed by Jean Frederic Bazille's ability to blend his colors and remove harsh lines from his paintings. In 1869 Bazille produced Young Woman with Lowered Eyes and the compelling use of the color and shadow in this work is intense. Furthermore there is an overwhelming sense in the picture that the artist has captured an intimate moment in his model's life. 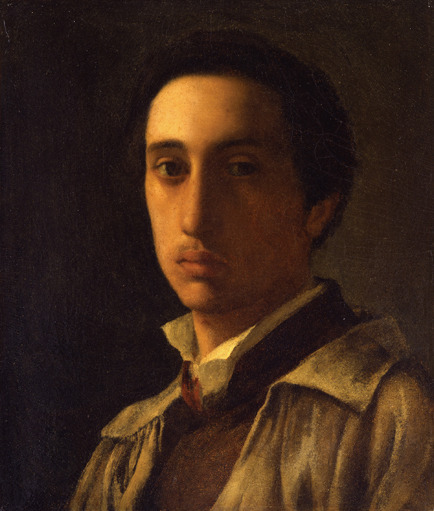 The lowered eyes of Bazille's model are similar to Edma's in Portrait of the Artist's Mother and Sister, although Edma has a more lonesome expression. Today Portrait of the Artist's Mother and Sister can be found at the National Gallery of Art, Washington, USA. Berthe Morisot's early drawing instructor Joseph Guichard introduced her to the Grand Louvre, the largest art museum in France. Nevertheless Morisot was unconvinced with copying the works of the great artists and demanded a different art instructor. She was taught by Camille Corot from 1860 onwards and was thrilled to work outside in the sunlight. Corot's influence can be seen in Portrait of the Artist's Mother and Sister as he encouraged Morisot to remove harsh lines from her paintings and create shapes through the manipulation of color. Berthe presented her compositions to the Salon de Paris, the official art exhibition room of the Académie des Beaux-Arts. Portrait of the Artist's Mother and Sister was showcased in 1870 much to the artist's chagrin. Impressionism was a 19th century art movement that grew among a collection of artists living in Paris. 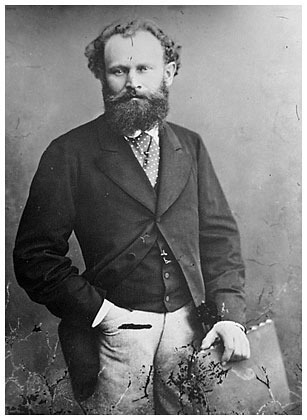 The leader of their group was Édouard Manet, although he did not consider himself an Impressionist, and other founders include Claude Monet, Pierre-Auguste Renoir, Edgar Degas, Camille Pissarro and Berthe Morisot. The movement grew from dissatisfaction with the Salon's strict submission rules. However Portrait of the Artist's Mother and Sister was painted before the Impressionist's joined together to showcase their work. Painters such as Monet, Renoir and Morisot choose to display their work in an alternative setting and rented their own room space. Although their first showcase was poorly received by the critics they went on to hold eight in total. The unreceptive public eventually began to appreciate the Impressionists and the artists received critical acclaim for their efforts. 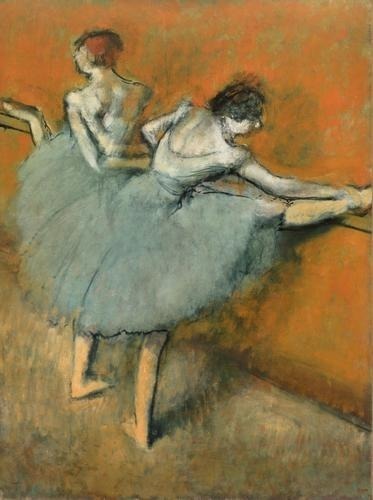 Impressionism subsided in the 1880s and many of the artists attempted painting in different ways. To read more about Berthe Morisot and her works please choose from the following recommended sources.